PMG Sports’ own Phil Dalhausser and Nick Lucena are currently the top men’s team on the beach in the United States. Phil Dalhausser and Nick Lucena have caught fire on the international beach volleyball circuit, capturing a 3rd Gold Medal in just their 5th FIVB World Tour event together as partners. 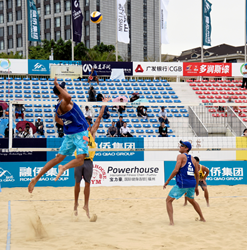 The duo battled the world’s top beach volleyball stars and wet conditions to win the 2016 Fuzhou Open in China on Sunday. Phil and Nick now sit atop the rankings as USA Volleyball’s top men’s team on the beach. After a 3-0 start in pool play, Dalhausser and Lucena cruised through the main draw to face Italy’s Paulo Nicolai and Daniele Lupo in the Gold Medal match on Sunday. They needed just 33 minutes to top the podium and finish at an undefeated 7-0 for the week. The duo is now in great position to be 1 of the 2 men’s teams representing the United States on the beach this summer. This week, Dalhausser and Lucena will take a tournament detour through New York City to appear on the Today Show Wednesday morning at 8:30 A.M. EST, celebrating 100 days until the official start of the Rio Games. Next week they will make their 2016 AVP Tour debut at the Huntington Beach Open held May 5th-8th. To discuss potential sponsorship opportunities with Phil Dalhausser and Nick Lucena, please contact Evan Morgenstein at evan(at)pmgsports(dot)com or call (919)459-5426. For media inquiries please contact Matt Uberseder at matt(at)pmgsports(dot)com or call (919)459-5428. Premier Management Group is an elite sports marketing agency with a goal to create a space in the industry that is completely unique through superior creativity and innovation. PMG Sports has set out to provide each of its clients with the same level of professional representation and service. Additionally, PMG Sports is an industry leader in providing corporate consulting services and treats each client, whether an athlete or corporation, with an added personal touch. For more information, visit our website at http://www.pmgsports.com.